Despite the fact that the weather still isn't co-operating, we check out a short little walk only about 300 metres from our campsite. The walk is about 5 minutes long and takes us down into another little bay called Monkey Bay which features a couple of interesting caves moulded by the constant wave action along the coastline here. The rest of this road is very scenic albeit windy, and as well as the scenery, you can see an abundance of birds such as Variable Oystercatcher. We saw a pair of Variable Oystercatchers which when approached began scurrying away (instead of simply flying away). We continued on the road and finally came around a point and were confronted by the sight of the beautiful Queen Charlotte Sound and a passenger and vehicle ferry which operates across the Cook Strait between Wellington and Picton. We stopped off in the town of Picton for an internet session, coffee, and a wander through town before heading off into the wilderness and beauty of the Marlborough Sounds. 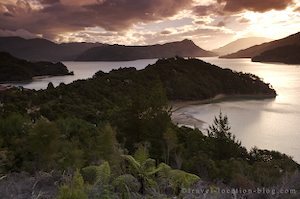 We chose to take the pleasant drive along the road which runs between Picton and Havelock called the Queen Charlotte Scenic Drive (a narrow winding road). From Linkwater the road becomes even more windier but it is well worth the effort once we reach the magical Kenepuru Sound. We travel the length of the sound before turning at the head to our left and travelling on the other side to Double Bay near the settlement of Hopewell, where we camped.